Hollywood Dreams Led Chinese Firm To Buy Into U.S. When the Chinese firm Wanda announced the purchase of AMC cinemas, it may not have made a lot of business sense in the short term. But it could be part of a larger strategy that will bring the company into the U.S. in a major way. 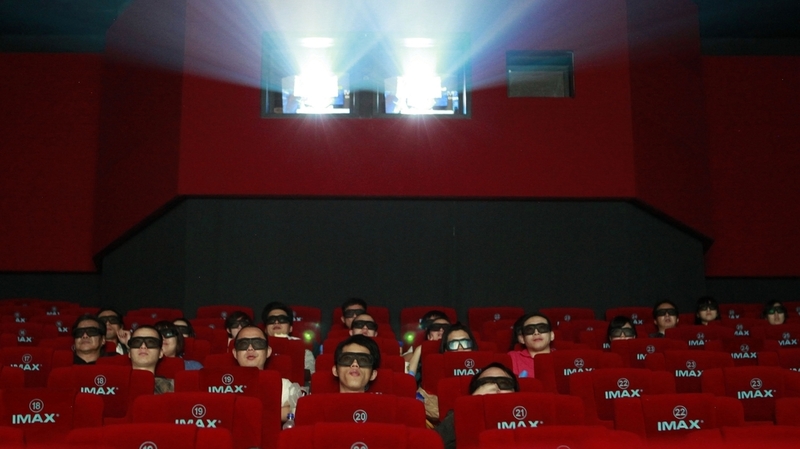 Hollywood Dreams Led Chinese Firm To Buy Into U.S.
Moviegoers watch a 3-D IMAX movie at a Beijing theater run by the Chinese company Wanda, which recently announced it was buying AMC movie theaters for $2.6 billion. The move is seen as part of a larger effort by the Chinese conglomerate to move into the U.S. market. One of the big movie blockbusters this year isn't a film, but a business deal. The Chinese company Wanda, one of that country's leading cinema owners, is buying AMC Entertainment, North America's second-largest movie theater company, for $2.6 billion. When the agreement was announced in China this week, it did not make a lot of sense at first glance. At least for the buyer. AMC is loaded with some $2 billion in debt, and movie theater attendance in North America was down 4 percent last year. Wanda, meanwhile, owns 730 screens in China, the world's fasting-growing movie market. But analysts say there's a logic behind Wanda's move. Aiden Sun, a senior analyst with Entgroup, a Chinese entertainment research company, says Wanda also wants to push into movie production. Buying an American cinema company would bring Wanda that much closer to Hollywood. Wanda's strategy isn't only to make profit from its cinema investment. A bigger part of it is to take Wanda's other businesses – like hotels – overseas through this channel. This is the idea behind its internationalization plan. "They are talking now to some famous producers and distribution companies, not only in the U.S., but also globally," he says. "And they want to cooperate with them to start co-production in China." Movie theaters are just a small part of Wanda's holdings. The company brings in $17 billion a year in revenue from nearly 50 shopping plazas, 40 department stores and more than two dozen five-star hotels. But China's property market is cooling. And analysts think Wanda may be looking to AMC as a base in the U.S. where it could buy up commercial real estate at bargain prices. "Wanda's strategy isn't only to make a profit from its cinema investment," says Gao Shouzhi, Entgroup's CEO. "A bigger part of it is to take Wanda's other businesses — like hotels — overseas through this channel. This is the idea behind its internationalization plan." The Communist Party is trying to improve China's image abroad and wants to use culture — including movies — to do so. Does that mean Wanda is looking to use AMC to mass export Chinese films? Rob Cain, a Los Angeles movie producer and consultant who has lived and worked in China, doubts it. "There's no way Wanda is going to fill its screens with Chinese movies," Cain says. "People just aren't going to pay to see them." Chinese conglomerates, even private ones like Wanda, have close ties to the Communist Party. So, Cain says, Wanda might give a little push to China's so-called "soft power" campaign and show the occasional Chinese film or travel ad. "I can see smaller ways where they could be good, patriotic Chinese citizens to help China spread its message around the world," Cain says. Wanda's purchase of AMC comes at a time of staggering growth in China's movie theater business. China has been adding about eight movie screens a day, according to Rance Pow, who runs Aristan Gateway, a cinema investment consultancy and research house with offices in Shanghai. Pow says what's driving that growth is rising incomes, better Chinese movies and new, state-of-the-art theaters. "There is a whole generation of moviegoers now who are growing up with cinema as part of their life and with more dollars in their pockets to spend for fun," Pow says. "They're choosing to go to see the movies as a priority." The difference between going to see a movie 10 or 15 years ago in China versus today is dramatic. Back then, you'd go to an individual theater. Chances are it hadn't been renovated in years; there were broken seats and a bad sound system. At a Wanda cineplex today in Shanghai, there are 10 screens including an IMAX screen with stadium seating. Shi Huihui is leaving a matinee of the Avengers 3-D with her husband and 3-year-old son, Chen Qiyu. Shi is in her 30s and works as an accountant. A decade ago, she says, she mostly watched movies on pirated DVDs. "Now I normally go to the movies to watch blockbusters," she says. "First, you can't watch a 3-D movie at home. Second, you can't get the experience of all this entertainment technology at home." More and more Chinese seem to feel the same way. Industry analysts expect China's box office to top Japan's this year to become the world's second-largest. China has about 10,000 screens — a little more than a quarter of the number in the U.S. That leaves a lot of room to grow.